Just got this email from HPB today. I think you might have to be on their mailing list to get this coupon? USEFUL INFO OVER. BELOW IS ONLY FOR SELF APPOINTED HOT DEAL POLICE. This post does have a region in the subject line. 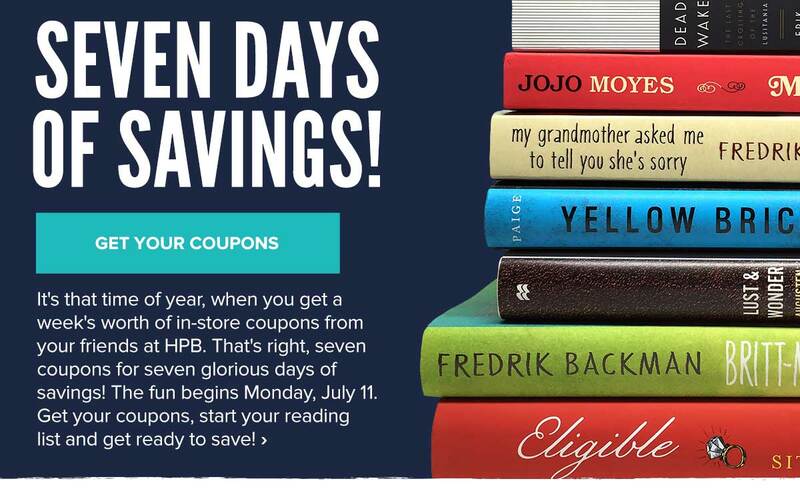 It does have a subject line that include the retailer and discount percentages, and HPB does have various boardgames for sell, and because you can pick and choose your own game to apply the coupon towards, the price is variable. This post does not self promote, it is not an auction, there are no referral links, and even if it is for HPB mailing list members only, the post said those are ok.
That post makes no mention of timeline requirement. Thanks for the heads-up about the coupons. I made sure I was signed up for their mailing list. On a side note: I also found that they feature an educators discount for teachers and librarians, which I didn't know about. Yes they do! And they seem pretty lax about checking it too? When I applied for mine, I had brought my paystub as proof as was mentioned by their website, the checkout lady just took me at my word and when I offered to show her my e-paystub she just said "nah that's ok. I trust you. No need to go through the trouble of taking it out". Which was really nice of her, but was surprising. Oh yeah, tons of in-shrink Minion Games and bottom-of-the-barrel Z-Man games always seem to end up at Half Price Books. Picked up a new copy of Mermaid Rain there for a $1, because at that price, I don't care if the game is awful or not (yet to try it). And it's always interesting to come across old gems hidden and ignored amongst the overpriced collections of Monopoly/Risk/Life. EDIT: Oh, and of course that rush from casting your suspicious eyes on a fellow traveller as they intrude upon the aisle, only to hear them whisper to their partner, "Oh look! They've got Battle of the Sexes!" FYI -- they do stock popular new board games too -- I've seen Legendary and DC comics deck building game and Fuse more recently at 20% off MSRP. SO with a 50% off coupon you are looking at 60% MSRP [or with a 40% coupon 48% off MSRP] for one of those NIS titles. Their new and used board game section is very much YMMV. I'd say whenever you can get a NIS boardgame at 50-60% off then that tends to be a hot deal. I received my coupons this week so I checked out my local HPB yesterday. They had FUSE, Codenames, Lanterns, Legendary, Sheriff of Nottingham and a few others – all new in shrink. At their sticker price plus the 50% Codenames would be $8, Lanterns $14, Fuse $12, Nottingham $13 so some pretty good deals after all. Thanks for the heads up. I'll have to hunt around for my copy of the coupons. I do not have any HPB near me, but I tipped this thread precisely because of that clause. The "not a hot deal" complainers are the thorn in the side of this forum, and the reason I would NEVER post a deal here, even if I knew where you could by [insert hottest new game here] for a penny for an entire case of them (free shipping included). After all, I might have failed to do my due diligence in researching all available prices, or maybe posted a deal of 60% off when the "truly informed" know where it can be had for 61% off. For every one of those jerks who complains, I dare say there are many of us who just shake our heads in silence, time after time after time, and feel sorry for the OP who took the effort to post. But, please, continue to feel free to call out the one person who dares to take a stand against the bullies. Yeah, that's a shame. I am reluctant to post here too for the same reasons. I am glad there are those who are willing to though. Hi James, I'm sorry if it came off snarky. Like you (I'm assuming), I would prefer it if we can be kind and nice towards each other. The only reason I added the blurb (half as a joke, half serious) was precisely because of the sniping commentaries (which contribute to the ' such a happy forum' vibe that you mentioned) made against people who take the time, and post with good intentions to notify the community of deals, impending or otherwise. Anyone got the coupon beside OP? I have signed up before and I only get the 10% off 1 time first custom email. subject is "Welcome to HPB!" After that, I have not get email from them. Actually I did receive the coupons in the mail after recently signing up with them. Using mine on Pathfinder Card Game which is already $30 in store. Am I doing this hot deals police thing correctly? The Pathfinder sets are only $29.99 each at HPB, Portal is $40. Some were straight MSRP, some were much lower than MSRP, most were 20% of MSRP. They also seem to usually get a big restock of NIS games right around sale time, at least mine does. I'm sorry you feel that way, but it seems like your comments have a major disconnect with reality. The "not a hot deal" posts amount to one (rarely two) replies every 10th thread or so. Threads with dozens and dozens of replies. That is a more of a "needle in a haystack" than a "thorn in the side". Likewise, the "one person who dares take a stand against the bullies"?? Seriously? Rewind to any of the dreaded "forum police" posts, and you'll see it summarily thumbed down and a dozen tipped and upvoted replies afterward bullying that person into the dirt for daring to quote the forum rules. And more to the point of my own post, this was a pre-emptive dig against potential "forum police". That introduced a negative tone where none had to exist, as these HPB threads pop up all the time and get plenty of helpful replies. This isn't as much standing up to the bullies as it is pandering to the majority. Yup, I think we can agree that a happy, helpful forum is the best forum. I don't think you were trying to inject negativity. But that's how it came across. "Forum police" get ridiculed almost every time they pop up. Do we really need to beat that drum in even more threads when it isn't necessary? And more to the point of my own post, this was a pre-emptive dig against potential "forum police". That introduced a negative tone where none had to exist, as these HPB threads pop up all the time and get plenty of helpful replies. It's 'pre-emptive' because I've seen them pop up in places where one can hope/assume they wouldn't post because posts related to those topics or vendors have historically been helpful (for example, the most recent pre-MM christmas in July sale). Just because one assumes that someone would know better or have something better to do, does not necessarily make it so. And so I put it in (as I noted above, which was done half in jest, half seriously.) but mostly borne out of a sense of frustration at some individual's persistence in making the form a more 'negative' experience. I don't believe that to be 'pandering' per the word's definition, and it was not the intention. As to whether it's necessary. Your contention is that it introduced a negative tone. I had wanted to preempt any potential back and forth about whether I was posting in the appropriate channels, which as I pointed out above, surprised me with where they have made their appearance even recently. As such, I delineated why my post was posted in accordance to the established guidelines; if my attempt at levity in delivering the message was perceived with a negative or hostile connotation, I would only say that it was not my intent. I suspect if I made a statement with any sort of strong personality, there will be some that take issue with some facet of it. I will also point out that some folks have posted back ribbing me in a similar spirit and I perceive no hostility in their response. Fundamentally, disregarding tone; which will be perceived differently by everyone, especially on an internet forum where there are no visual cues to telegraph one's intent; I made a post in an effort to inform of an upcoming discount event. It was done so in accordance with the rules. I separated the useful info portion of my message with the blurb. The above is my rationale and I hope it will clarify any misinterpretation of my intent. Likewise, the "one person who dares take a stand against the bullies"?? Seriously? Rewind to any of the dreaded "forum police" posts, and you'll see it summarily thumbed down and a dozen tipped and upvoted replies afterward bullying that person into the dirt for daring to quote the forum rules. On a point of clarification, an occurrence rate of 1-ish every 10 thread or so, (using your numbers), is around 10-ish percent. I would suggest that whether a 10% recurrence is needle/thorn level inconvenience is best left for the individual to decide for themselves. Also, the thread that is consistently linked at https://boardgamegeek.com/thread/1417183/what-hot-deal are guidelines, not rules. Being punished for daring to quote the rules is not right. Being communally called out for linking a set of guidelines when those guidelines were not being trespassed is less daring and/or tragic. Welcome to the Hot Deals forum, easily the most unfriendly, unwelcoming place on BGG . I certainly do use the forum a lot for deals, but I'd never dare to post one here for the same reasons mentioned previously.